DETAILS: Imagine vacationing in a brand new home in one of the most desirable and private locations in Watercolor. Just completed an entire renovation including all new electric fixtures inside and out, all new high end appliances, new counter tops, new floors, new decking and screens, new mattresses, all brand new furniture from Beau Interiors, painted inside and out. Every detail is perfect! 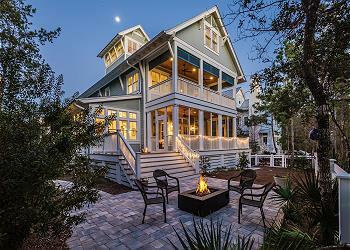 This home exemplifies the charm and location of classic Watercolor with all the brand new bells and whistles. Located near Camp Watercolor, beautifully furnished and ready to enjoy. One of a kind house new to the rental program! Sleeps 10 inside plus 6 possible on upstairs screened sleeping porch. Six person electric golf cart plus access to private championship golf clubs - Camp Creek and Shark’s Tooth. We had the best girls’ weekend! The house was everything the pictures showed and more! We were located in a perfect spot in watercolor (quiet, beautiful, and easy distance from everything)... plus having the golf cart availability made it so easy to get to the beach! The decor and set up was perfect for the group of us. Can’t say a single negative thing, it was great! Fabulous home perfect for a vacation! Beautiful yet comfortable decor! Seating areas conducive for visiting with friends and family - and awesome porches! ! Fully stocked kitchen, close proximity to many restaurants and the beach! Bicycles and golf cart for transportation - no need for a car ride! Beds extremely comfortable! Ideal escape! Very happy home! I had no idea January was such a great time to visit! Lovely! We could not agree more! This home is perfect for a relaxing and fun getaway and the house is more than accommodating for everyone! Thank you for staying with 360 Blue, we look forward to hosting you all again very soon! This Thanksgiving was the best ever! My husband, me and my daughter's family stayed at Blue Honey. We had a wonderful BBQ for 27 the night before. Plenty of room. The big island in the kitchen was a great place to gather. We loved this cheerful and welcoming home! We are so thrilled that you all enjoyed your Thanksgiving vacation with us in Watercolor! We especially love the festive photo you shared with us, it is such an adorable idea! We agree that this home is such a wonderful place to come together and make memories. Thank you for staying with 360 Blue, we hope to see you again soon! Beautiful home and place! Fantastic and luxurious home base for beach trips but also an excellent place to stay in when it's raining. Fabulous interior design and amenities. We are so delighted that you all enjoyed your vacation with us in Watercolor! 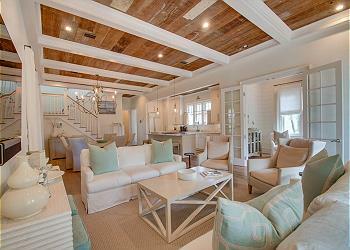 We agree that this home is a great place to escape to enjoy the beach or to just sit back and relax! We look forward to seeing you all again soon! Thank you for sharing your home with our family. Your house was just perfect. Our grandson loved his first time at the beach. We are so thrilled that you and your family enjoyed your vacation with us in Watercolor! We especially loved the photo you shared with us, it is absolutely adorable! Thank you so much for staying with 360 Blue, we look forward to seeing you all again very soon! We had a wonderful time in Watercolor and thoroughly enjoyed this fantastic home. The home was beautifully decorated and very comfortable. Loved sitting on the porches in the morning and evenings. It suited our group of mothers and their daughters perfectly. It was so close to the tennis courts which made it nice to make it to cardio tennis in the mornings. We enjoyed the usage of the golf cart and bikes that were provided. Thanks so much for sharing your home. We are so delighted that you and your group enjoyed your vacation with us! We agree that this home is a wonderful option for a fun and relaxing getaway for everyone! We look forward to seeing you again very soon! Our family enjoyed our stay at the “Blue Honey”. The home is very well kept and the couch, chairs and pillow coverings are all laundered fresh for each new guest. This made our stay even more comfortable and relaxing. We did have issues with the golf cart provided with the rental. However, 360 Blue arranged for a replacement through Electric Cart Company. The staff at 360 Blue were extremely responsive and their quality customer service will be the reason why we’ll use them for future rentals. The home is in a great location and with a golf cart or bike you can get to the Watercolor Club for beach access in a short 5-7 minute ride. Can’t wait for next year! We are so happy to hear that you enjoyed your stay in this amazing home. We loved working with you and are so thrilled we were able to make your stay enjoyable. We look forward to seeing you back soon for your next beach getaway! We had a great week at "Blue Honey." The house was beautiful and in a great location- on a quiet street and an easy walk to the beach, pool, Publix, and Seaside. The smart TVs in every bedroom was very nice and the kitchen was well equipped with top of the line appliances. The house was very clean and 360 Blue offered great service as always. We are so glad that you had such a great week in this beautiful home! The location of the home makes accessing the beach and pool super easy, we agree! Having a grocery store and Seaside so close makes it very convenient as well. This home has something for everyone, whether it be relaxing and watching one of the Smart TVs or cooking a meal in the well equipped kitchen. We are thrilled that you found the home to be so clean and that we were able to provide you with great customer service. Thank you for the awesome review! I never wanted to leave this charming house! I loved how there is a front porch and back porch and a porch upstairs off the bedrooms with bed swings. Everything is top of the line - tvs, kitchen, etc. It truly feels like a home away from home! The porches of these home really put it a step above the rest. We are so thrilled you found your perfect home away from home to come back to time again. We look forward to seeing you back soon! Wonderful time at this beautiful home! So thoughtfully furnished & equipped with everything to make our stay comfortable and special! Can’t wait to come back to this house in the future! Thank you for choosing 360 Blue! We are thrilled that you had such a wonderful winter getaway. We look forward to having you back soon! this was our first time during the winter holidays and it was amazing. the beach is still awesome - but more magical. we will be back next year. a new family tradition. 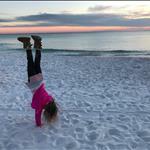 There is certainly something magical about the beach in the winter. So beautiful and serene, and the absolute best sunsets. We are thrilled you enjoyed your stay in this amazing home and we look forward to seeing you again next year!